In most sectors of textile manufacturing process, automation is one of the major key to quality improvement and cost competitiveness. Early modernization and technical developments in textiles concentrated on the automation of textile machines and their processes. Now automation has taken place in all the processes involving textile manufacture i.e. cotton picking, ginning, spinning, weaving, and processing and even to some extent in garment making, resulting in enormous gains in productivity and efficiency. Some of the changes that have come about in textile industry are recapitulated below. Now a days automation is widely used in fiber manufacturing system. In case of increasing emphasis on product uniformity and adherence to quality standards continues to require fiber diameter monitoring, temperature and tension control, and monitoring of the solution properties of the polymer. These requirements are especially critical in micro-denier fiber extrusion, a process that produces fibers and eventually fabrics of truly different properties. 2. 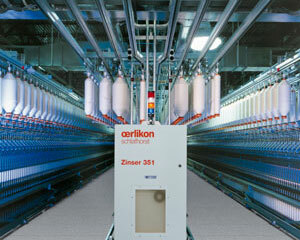 Cotton mixing in blow room has been automated so that cotton from several bales can be drawn and mixed together, forming a more homogeneous mixing of cotton, thus reducing batch to batch variation in cotton spun yarn lots. 3. Carding machines using chute feed systems, auto levelers for improvement in quality or productivity and reduced handling have helped in increasing evenness in the yarn. 4. Autoconers with splicing and yarn fault detection have been devised to obtain yarns with lower unevenness and better quality. 5. The ring spindle speeds have gone upto 20,000 and high-speed rotors upto 1,00,000 rpm are available. Today, spinning machines can produce yarns upto 20 times faster than what they used to produce 20years ago. Weaving technology has seen advancements, automatic shuttle looms and automatic shuttle-less looms(e.g., Methods of holding the yarn such as rapier and the gripper) with advantages of higher productivity, superior quality etc. Weaving and knitting machine builders have been leading the way in utilising computer technology in textile manufacturing for many years with their use of CAD, bi-directional communication and artificial intelligence. With the availability of electronic dobby and jacquard heads, automatic pick finding, and needle selection, etc these machines are the most easily integrated into computer networks of any production machines. Automated process includes control on the slasher and the weaving functions of (1) Automatic Pick Repair (2) Automated Warp breakage Locator and (3) Computerized Machine Control. Manual assistance is still required for beam replacement and repair of warp breaks. The very important area for Automation is the dyeing process, because it involves lot of minute parameters which are very critical. Even in milligrams variation of recipe can change the shade of the fabric. All the parameters for dyeing like temperature, pressure,water level, water flow, circulation and time of treatment are most important. Automation of the dyeing process can improve the productivity by controlling the above parameters very accurately. Automation in textile finishing industry is not a new concept, but it is being modern day by day. The textile factory is characterized by a considerable fragmentation of the production cycle into a number of segments specialized in the production processing of different fibers/yarns. The popularity of personal computers in case of textile finishing. A complete automation process from production to shipping. A complete reduction of manual bobbin handling, which results in a substantive direct improvement of product quality. A secure and efficient material/product flow through the compact system configuration. A big reduction of labour costs which results into quick return of investment ( less than 3 years payback time ). A clean, proper and efficient production environment. A complete PLC controlled workflow grants real time –control, comprehensive data management and the possibility to look and call for synchronous manufacturing production data through human machine interfaces for integration into an overhead PPS system. The possibility to overlook and follow up the production from the beginning to the end leads into quality improvement. And the customer service. And last but not least a safe and ergonomic workflow . Why Automation is Necessary in the Textile Industry? Why is Automation Important in the Weaving Sector?